I was recommended this book by Dr. P. C. Gupta, who is the vascular surgeon who created my fistula. I hold him in very high regard. He is considered one of the finest vascular surgeons in the country, someone who can literally create a fistula out of nothing! He's known me for quite some time now and told me about this book the last time I went to meet him about some numbness on my fistula arm. The book is not available in India and I had my brother in the US order it from Amazon. It came to me after a few weeks. The book is written by David L. Axtmann who was on dialysis for more than thirty years when he wrote the book. He was diagnosed with kidney disease in 1968 when therapies like dialysis and kidney transplants were still in their early stages. Axtmann died in 2004, after about 36 years on dialysis. 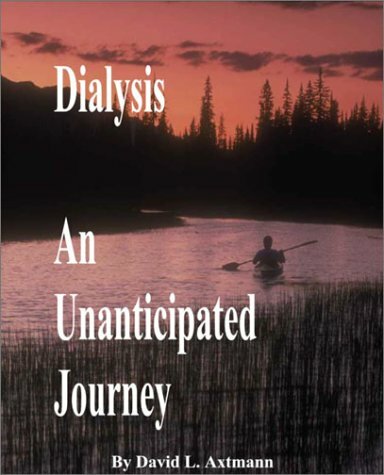 In the book, he describes his journey with kidney disease and dialysis. These were days when you got dialysis only if you were between 15 and 55 years of age because of the lack of widespread availability of the treatment. In those days, patients were taught to assemble their own dialyzers. There was no blood pump and patients dialyzed for about twelve hours each time. A lot of the patients got dialysis at home. Axtmann takes us through the turbulent times he faced describing with great detail the various medical and other problems he had while getting treated. What is striking is his desire to continue studying, at first and then working even as he struggled to cope with all the problems dialysis brought with it. Axtmann was lucky to be supported by his wife Marlene throughout the journey. They also had some very good neighbours who stood by them in every hour of crisis. Apart from being a very inspiring story, the book also gives some very good insights into how healthcare facilities, specifically dialysis were in the 1960s and after in the US. I often wonder why the US has been the birthplace of so much medical innovation. The book gives you some nice details on how dialysis patients were treated, how the quality of life was so important, how doctors valued the patient's will and how they were so completely committed to bettering what was available. I would recommend this book to anyone who is on dialysis r is caring for dialysis patients. It teaches us a few important lessons. Dialysis definitely need not be the end of life. Despite being on dialysis, we can live fulfilling, productive lives, lives that we were meant to lead had kidney disease not happened. I would like to read such a book but the thought of extreme differences in the U.S way of patient care, facilities, challenges, food , cost of living, insurance etc kind of demotivates because it is too different from us. Kamal Ji you are yourself an equally good example to live by. Why don't you write a book about your experience with dialysis.Indian readers would feel instant connect with your book than with an author of a different country.